You've made three beautiful tallitot with techelet for me, and now I may be interested in ordering a fourth. I was a little embarrassed to learn in a recent shiur that the meaning of the stripes in a tallit are a kind of mourning/reminder of techelet. So my beautiful new black-striped tallit with techelet is redundant at best, and just plain ignorant at worst. I'm wondering if I could make use of my existing techelet and retie them onto a new white tallit. Or maybe best to just start fresh? I'd be interested in a slip-free white-on-white tallit with thick Ptil Tekhelet tied according to the Rambam. I would hesitate to go so far as to say "redundant." I have heard this explanation regarding the origins of the black stripes a few times. It sounds plausible to me, but on the other hand, once a custom sets in we have to show due respect for it. As my friend Shraga Simmons of Aish HaTorah writes, "the current custom of black stripes is keeping within the synagogue decorum, which has value in and of itself." I once came across another explanation for the black stripe that I liked even more, but I think it was based on conjecture, not evidence. 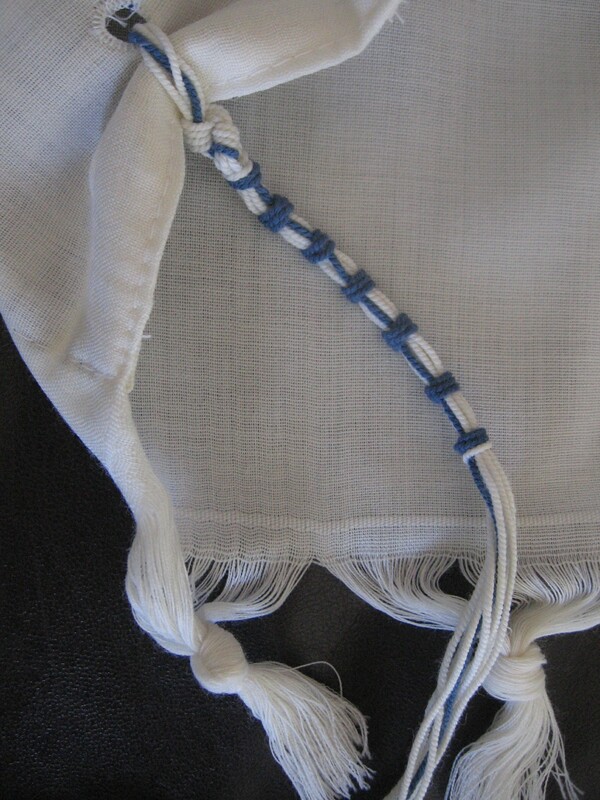 You may be familiar with the Mishnah that discusses the earliest time we can don tzitzit with a brachah. According to this explanation, once techelet was lost we no longer had a way to figure out whether it was time to put on the tallit, so blue striping was introduced, then somewhere along the way tallit stripes morphed from blue to black. I know a lot of people who hold very strongly by techelet (e.g. the Zilberman community, where even boys wear techelet from a young age), yet they wear a black-striped tallit. All of the above is just my own thoughts, I'm not trying to say anything conclusive. I realize I'm not doing a very good job of promoting sales. I guess I'm lucky I don't have a sales manager over me. If you do decide to make a change, keep in mind that untying Rambam knots is very difficult. It could take you an hour of hard work. Also, you might have a problem of tzitzit that are very crinkled at the points where the knots were.